Leaf to 40 cm long, dark green. Inflorescence usually <30-flowered, moderately crowded. Flowers pinkish white and greenish brown, fragrant, long-lived (up to 2 weeks). Dorsal sepal ovate to lanceolate, to 11 mm long, sometimes tip knobbed. Lateral sepals linear to lanceolate, to 11 mm long; sometimes free throughout but more often free only at the base, united at the centre with free tips ending in thickened knobby 'tails'. Lateral petals linear to lanceolate, to 10 mm long, ending in narrow knobby tips and with a darkened central stripe. 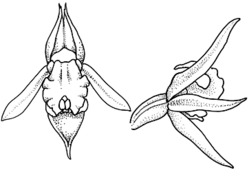 Labellum to 12 mm long and 6 mm wide, ovate-oblong and sessile when flattened; in living flowers the top half strongly recurved to reflexed so that the tip touches the base of the lamina without protruding from between the lateral sepals, upper margins strongly but irregularly folded to crisped or ruffled. Callus plate ovate, greenish yellow with a central channel, the tip entire or weakly forked but never extending far beyond the upwardbend in the lamina. Column with linear to oblong and pinkish column wings; rostellum held higher than the column wings. Distribution and occurrence: Grows in grassland and woodland above 800 m alt., in red basalt or brownish gravelly loams; uncommon and probably restricted to the New England Tableland.